Most people feel bottled up with their emotions and do not know how to safely and effectively release them. Emotions are just forms of energy that if not released will end up physically harming the body (heart attacks, cancer, etc). 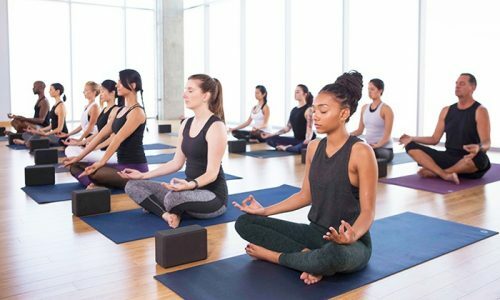 This workshop will provide students will insights, tools and techniques to employ when emotional and physical tension challenges the ability to experience comfort, joy and equanimity. The session will begin with a group discussion facilitated by Jon that will entail identifying and understanding emotions. This exchange will enable students to engage in the physical and energetics practices that follow with greater ease and awareness. o A moderately-paced flow yoga sequence, illuminated by bio-energetic principles and designed to urge the rising up of emotional energy. o Emotional release techniques intended to safely encourage the movement of emotions out of the body. Jon Burras is a certified Body/Mind therapist with over thirty five years of experience in the health field. He is also a yoga teacher, yoga therapist, bodyworker, international lecturer and published author of Return to Nature: The Five Pillars of Healing. He has taught a variety of workshops, lectures and conferences over several decades to help students to understand the roots of their pain and provide methods for healing and growth. This dynamic class combines the practice of yoga with the benefits of body weight and functional strength training. With sections of the class dedicated to Vinyasa Flow, core strength, and strength training using free weights, this class has it all. Increase strength and muscle tone and become more flexible while you move to some uplifting tunes. Let go and move to the music then rest in a well-deserved savasana. Appropriate for all levels although previous yoga experience is suggested. Room heated to 85-87 degrees. This session will be led by Tracy Bauer. Our signature YogaWorks Heated Flow class is a well-planned, balanced sequence which combines flexibility, strength, and balance to work your entire body. This class will link movement to breath set to an upbeat soundtrack and will be sure to challenge you both physically and mentally. You can expect traditional sun salutations, standing poses, balance postures, inversions, and backbends ending with a well-deserved final relaxation (savasana). Room heated to 85-87 degrees. *ENROLLMENT NOTE: Advance price registration for this event is not available through the mobile app. Please visit YogaWorks.com/workshops or call Yoga Tree Potrero at (415) 655-3936 to register at the advance price. Reiki is the Japanese form of energy healing. It is spiritually guided life force energy being reestablished within the body's energy system. Due to depletion of the life force energy, we are feeling undue stress, dysfunction, dis-ease, and more. In this circle, participants will be guided by Courtney Parkyn through a systematic relaxation meditation to settle energy and regulate the nervous system. Upon the completion of meditation, Kerry Walker-Collins and Courtney will facilitate a Reiki healing attunement, a temporary energetic revitalization to help reduce stress, increase energy, and enable emotional emotional clarity and spiritual growth. The circle will be accompanied by sound healing and aromatherapy to encourage a continually deepening experience. Courtney Parkyn has been teaching yoga and meditation since 2008, is a Reiki master, and a teacher trainer for YogaWorks. She teaches classes and workshops throughout Orange County, and offers yoga and meditation group retreats. In her teachings, she weaves together the physical practice of yoga with the principles of Ayurveda and the energetics of tantra, offering a complete experience for her students. Kerry Walker-Collins has been a Usui Reiki Master teacher since 2007, facilitating reiki group circles, workshops and classes on reiki and related fields. She began her career in Reiki Wellness in a medical office in South Laguna, where she taught and provided reiki to hundreds of surgical patients as well as physicians training in the office, from all over the world. In 2011, she opened her space, Mystic Reiki & Wellness, located in downtown Laguna Beach. 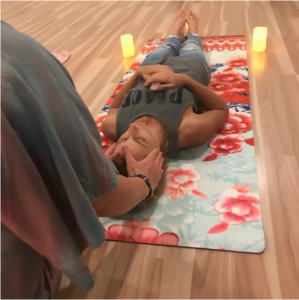 Kerry provides her private Reiki services, and classes, as well as collaborating with Courtney Parkyn at yoga studios and retreats in various locations. *ENROLLMENT NOTE: Advance price registration for this training is not available through the YogaWorks mobile app. To purchase at the advance price, visit yogaworks.com/workshop/reiki-healing-circle-meditation-mission-viejo or contact YogaWorks Mission Viejo at (949) 380-9642. Please join Jennie for a journey into the deeper layers of yoga and the deeper layers of yourself. This workshop will include a blissful 90-minute restorative yoga session, followed by a mind-clarifying 30-minute pranayama/breathwork sequence. The final half-hour will include 15 minutes of centering/balancing meditation capped off with a long, luxurious savasana. This workshop will help you reset and balance your body, mind, and spirit, allowing you to return to your most authentic self. Through this experience, we can all begin to peel back the layers we have created around ourselves and dive deeper within. Open to all; no experience necessary. Jennie Jalalat has been journeying deeper into yoga for decades and has been teaching for over 10 years. Her focus is on connection, and that is why she instructs group classes, teaches private sessions, and leads teacher trainings - everything is an opportunity for her to better connect with her most authentic self while creating space for others to more truly connect with themselves. When she’s not teaching yoga, you’ll find her reading a book, walking in nature, or playing with her cats. *ENROLLMENT NOTE: Advance price registration for this training is not available through the mobile app. Please visit YogaWorks.com/workshops or call YogaWorks Newport Beach at (949) 640-9642 to register at the advance price. You are a unique, magnificent, snowflake of a human. Your body, though also unique, magnificent, and one-of-a kind, has a particular structure and system of tension and compression that operates more universally. Basically, we are all so different, and yet we are also very much the same—especially when it comes to yoga poses. The “moving mechanics” of static poses and the body’s “habits”. How to identify the common misalignments in poses and how to self adjust into a more sustainable position. How to become your own best teacher. Nicolette David has been a teacher of languages, literature, biology, and movement since 2001 but found her true passion in 2010 when she started teaching yoga. Her classes focus on alignment not for the sake of getting things "right" but with the intention of locating ourselves from within. Her teaching is full of heart, creativity, and the hope that students FEEL themselves beyond the physical realm using their breath and their eyes that see from, and into, all possible perspectives. .
*ENROLLMENT NOTE: Advance price registration for this training is not available through the YogaWorks mobile app. To purchase at the advance price, visit yogaworks.com/workshop/reiki-healing-circle-meditation or contact YogaWorks Laguna Beach at (949) 415-0955. Enjoy an evening of systematic relaxation (Yoga Nidra), vibrational sound healing with crystal bowls, Tibetan bowls, chimes and other instruments, guided breath-work and seated meditation. We will work on letting go of physical tension, as well as mental and emotional stress. The goal of the session is to leave participants feeling more embodied, less distracted by the mind, and ready to relax and enjoy the weekend. 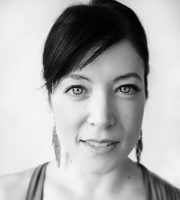 Courtney Parkyn has been teaching yoga and meditation since 2008, is a Reiki Master, and a teacher trainer for YogaWorks. 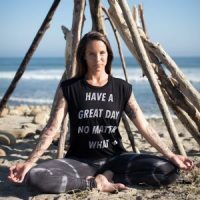 She teaches classes and workshops throughout Orange County, and offers yoga and meditation retreats. In her teachings, she weaves together the physical practice of yoga with the principles of Ayurveda and the energetics of Tantra, offering a complete experience for her students. *ENROLLMENT NOTE: Advance price registration for this training is not available through the mobile app. Please visit YogaWorks.com/workshops or call YogaWorks Mission Viejo at (949) 380-9642 to register at the advance price.